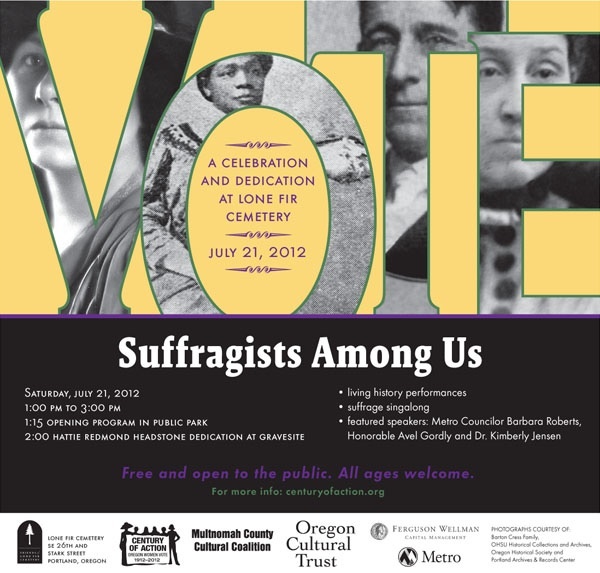 On Saturday, July 21st, Century of Action and Friends of Lone Fir Cemetery partnered for a spirited afternoon celebration of woman suffrage and headstone dedication for African American Suffragist Hattie Redmond. Attendees learned about her and the other suffragists who rest in Lone Fir through live history performance and singing. Program highlights included Metro Councilor Barbara Roberts as the keynote speaker, former State Senator Avel Gordly dedicating a grave marker for Hattie Redmond, a prominent black suffragist recently discovered at the cemetery, and actors in period dress portraying noted suffragists buried at Lone Fir. Thanks to over 200 people who joined us!